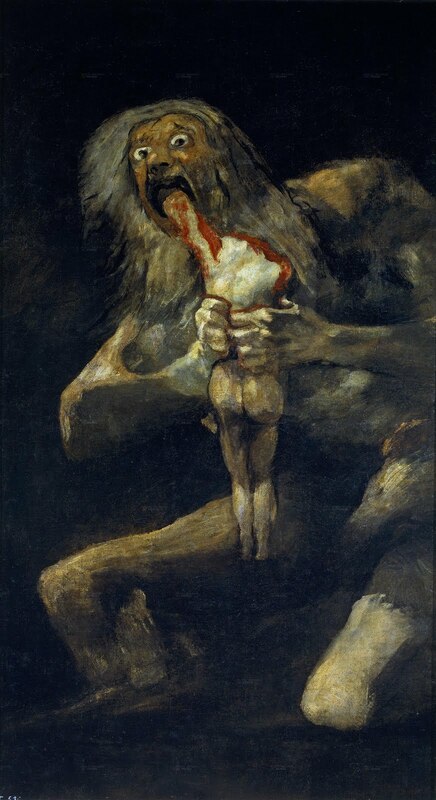 Saturn Devouring His Son is the name given to a painting by Spanish artist Francisco Goya (1746 – 1828). According to the traditional interpretation, it depicts the Greek myth of the Titan, Cronus (in the title Romanised to Saturn), who, fearing that he would be overthrown by one of his children, ate each one upon their birth. The work is one of the 14 Black Paintings that Goya painted directly onto the walls of his house, never intended for public view, sometime between 1819 and 1823. It was transferred to canvas after Goya’s death and as such is technically untitled. and has since been held in the Museo del Prado in Madrid.